It is also recommended to use ice in subacute stages after exercising to prevent swelling.9. 1. Thompson C, Kelsberg G, St Anna L, Poddar S. The Journal Of Family Practice. 2003;52(8):642-3. 2. Deal DN, Tipton J, Rosencrance E, Curl WW, Smith TL: Ice reduces edema: A study of microvascular permeability in rats. J Bone Joint Surg. 2002;84-A:1573-1578. 3. Schaser KD, Vollmar B, Menger MD, Schewior L, Kroppenstedt SN, Raschke M, Lubbe AS, Haas NP, Mittlmeier T: In vivo analysis of microcirculation following closed soft-tissue injury. J Orthop Res. 1999;17:678-685. 4. Hocutt J et al. Cryotherapy in Ankle Sprains. American Journal of Sports Medicine. 1982;10:316-319. 5. Algafly AA, George KP. The effect of cryotherapy on nerve conduction velocity, pain threshold and pain tolerance. Br J Sports Med. 2007;41:365-369. 6. Chesterton LS, Foster NE, Ross L: Skin temperature response to cryotherapy. Arch Phys Med Rehabil. 2002;83:543-549. 7. Hayden CA. Cryokinetics in an early treatment program. Phys Ther 1964; 44:990-993. 8. Knight KL, Brucker JB, Stoneman PD, Rubley MD. Muscle injury management with cryotherapy. Athletic Therapy Today. 2000;5:26-30. 10. Wyatt J et al. Oxford Handbook of Accident and Emergency Medicine. Oxford, Oxford University Press. 1999. 11. Walgenbach A. The ankle joint: the evaluation and treatmnet of sprains. Nurse Practitioner Forum. 1996;7(3)120-124. 12. Price R, Lehmann JF, Boswell-Bessette S, Burleigh A, deLateur BJ. Influence of cryotherapy on spasticity at the human ankle. Arch Phys Med Rehabil 1993; 74: 300–304. 13. Hayden CA. Cryokinetics in an early treatment program. J Am Phys Ther Assoc 1964; 44: 990–93. 14. Lubowitz JH. Thermal modification of the lax anterior cruciate ligament using radiofrequency: efficacy or catastrophe? Journal Of The ESSKA. 2005;13(6):432-6. 15. Hecox B. Clinical effects of thermal modalities. In: Hecox B, Mehreteab TA, Weisberg J eds. Physical agents. Norwalk, CT: Appleton & Lange, 1994:94–123. 16. Lehmann J, Masock A, Warren C. Effect of therapeutic temperatures on tendon extensibility. Arch Phys Med Rehabil 1970; 51: 481–87. 17. Knight CA, Rutledge CR, Cox ME, Acosta M, Hall SJ. Effect of superficial heat, deep heat, and active exercise warm-up on the extensibility of the plantar flexors. Phys Ther 2001; 81: 1206–14. 18. Carol CT Vance, Rajan Radhakrishnan, David A Skyba, Kathleen A Sluka. Transcutaneous Electrical Nerve Stimulation at Both High and Low Frequencies Reduces Primary Hyperalgesia in Rats With Joint Inflammation in a Time-Dependent Manner. Physical Therapy. 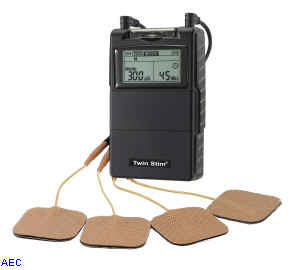 2007;87(1):44-51.
transcutaneous electrical nerve stimulation (TENS) increased locally and unilaterally? A randomized placebocontrolled trial in healthy subjects. 20. Kim KM; Croy T; Hertel J; Saliba S. Effects of neuromuscular electrical stimulation after anterior cruciate ligament reconstruction on quadriceps strength, function, and patient-oriented outcomes: a systematic review. J Orthop Sports Phys Ther. 2010;40(7)383-91. 22. Currier DP; Ray JM; Nyland J; Rooney JG; Noteboom JT; Kellogg R. Effects of electrical and electromagnetic stimulation after anterior cruciate ligament reconstruction. J Orthop Sports Phys Ther. 1993;17(4):177-84. 23. Papatheodorou LK, Malizos KN, Poultsides LA, Hantes ME, Grafanaki K, Giannouli S, Ioannou MG, Koukoulis GK, Protopappas VC, Fotiadis DI, Stathopoulos C. Effect of transosseous application of low-intensity ultrasound at the tendon graft-bone interface healing: gene expression and histological analysis in rabbits. Ultrasound Med Biol. 2009;35(4):576-584. 24. Wong RA, Schumann B, Townsend R, Phelps CA. A Survey of Therapeutic Ultrasound Use by Physical Therapists Who Are Orthopaedic Certified Specialists. Physical Therapy. 2007;87(8):986-994. 25. Cole MD, Becker BE (eds). Comprehensive aquatic therapy, second edition. Butterworth-Heinemann, 2004. 26. Pittler MH, Karagulle MZ, Karagulle M, Ernst E. Spa therapy and balneotherapy for treating low back pain: meta-analysis of randomized trials. Rheumatology. 2006;45:880–84. 27. Noh DK, Lim JY, Shin HI, Seoul NP. The effect of aquatic therapy on postural balance and muscle strength in stroke survivors – a randomized controlled pilot trial. Clin Rehabil. 2008;22(10-11):966-976.